The instructions for the application are included in the word document. Please note that the application must be mailed in and the postmark must be no later than April 21, 2019. 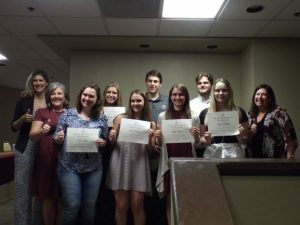 The Austin Texas A&M University Mothers’ Club award scholarships each year to current A&M students that have 30 hours or more that have been graded and completed at Texas A&M University in College Station, Galveston or Qatar. These scholarships are based on academic standing and involvement in Texas A&M University organizations and community outreach programs. The awards are not based on financial need, or affiliation with the Austin Texas A&M University Mothers’ Club. One of our most important functions at Austin Aggie Moms is to provide scholarships for Aggies. In addition to our Local Merit Scholarships, we have two endowed scholarships, the Sutherland Aggie Leader Scholarship and the Opportunity Award Scholarship that are available to Aggies from the Austin area. Our third endowed scholarship for Transfer Students will be available next year.